Candidate Donald Trump promised better, cheaper healthcare for all. Just days before his inauguration, he said he’d deliver “insurance for everybody.” His plan to repeal and replace the Affordable Care Act would come “in a much simplified form – much less expensive and much better,” he told The Washington Post. It never happened. About 28 million Americans remained uninsured last year, up from 27.3 million from 2016, according to a Census Bureau report released last month. Despite Trump’s repeated attacks, Obamacare keeps ticking. Nearly 12 million Americans signed up for coverage this year. Trump finally did come up with an alternative, of sorts. His administration unveiled new rules in August to allow skimpy, low-cost, short-term insurance plans that critics called junk. These plans lack the 10 essential health benefits required in ACA exchange plans. If healthy people choose the new plans to save money, it could raise insurance costs for sicker people in the plans, analysts warn. Coverage of pre-existing conditions -- the most popular element of Obamacare – animates many midterm contests, as House Republicans who voted to repeal Obamacare scramble to assure voters they’ll protect that coverage. Asked if they support Medicare for all, seven in 10 people said they do, a Reuters-Ipsos poll in August reported. That includes 85 percent of Democrats and 52 percent of Republicans. But what, to paraphrase Freud, do consumers want? “Medicare for all” is shorthand for a range of plans. Medicare for All – with a capital A -- would throw out the current employer-based health insurance system and replace it with a single-payer, government plan. It is what Sen. Bernie Sanders, independent of Vermont, proposes. But Medicare for all -- lower case a – could describe various national plans proposed by Democrats that would move incrementally toward universal healthcare coverage. Two questions in a Kaiser Family Foundation survey in March illustrate how wording of the question matters. Asked: “Do you favor or oppose having a national health plan, or Medicare-for-all, in which all Americans would get their insurance from a single government plan?” about 60 percent said they favor it. But when asked about “having a national Medicare-for-all plan open to anyone who wants it but people who currently have other coverage could keep what they have,” support surged to 75 percent. Sanders, who first introduced a single-payer bill in 1993, is not as lonely as he once was. His Medicare for All bill has about 15 cosponsors. About 70 Democrats in Congress have formed a Medicare for All Caucus, and a Democratic House member from Washington state announced a Medicare for All PAC to back candidates financially. The sticking point, of course, is the cost. Sanders insists individuals would save money on insurance and medical bills, but both the liberal Urban Institute and libertarian-leaning Mercatus Institute at George Mason University estimated federal expenditures would rise at least $32 trillion in the first 10 years. The Congressional Budget Office has not run estimates, apparently because Sanders’ plan has so little chance in the Republican-controlled Congress. Democratic Sens. Tim Kaine of Virginia and Michael Bennet of Colorado are cosponsors of Medicare X, a phased-in plan that would allow all Americans to buy into Medicare. Starting in counties where the ACA exchanges lack competition, it would open nationwide in 2023 and to businesses in 2024. Corey Stewart, Kaine’s Republican opponent for the Senate in November, promises “full repeal” of Obamacare. Critical to the debate is the 56 percent of Americans who get health insurance through their employers. In a strong economy, they may have little incentive to switch to a government plan. Virginians as well as voters in other states soon will start deciding what Medicare for all might mean for them. Joe lifted the wire-rimmed eyeglasses from a small wooden desk and held them as tenderly as he would a religious relic. Joe, a guide at the Yeats Memorial Building in Sligo, Ireland, was giving two American tourists an impromptu tour of an exhibit on poet William Butler Yeats’s family and the people and places that influenced him. Nobody was around, so Joe let me sit at the desk, briefly. Since I fell in love with Yeats and James Joyce in college, I’d wanted to visit Ireland. I was thrilled to find my literary lights undimmed, but I never dreamed I’d sit at Yeats’s desk. That was magical. When the Irish refer to a “full Irish,” they mean a big breakfast, but my traveling partner and I had a full Irish literary and historical feast this month. Yeats, who lived from 1865 to 1939, spent much of his boyhood in County Sligo, his mother’s home in the country’s northwest. 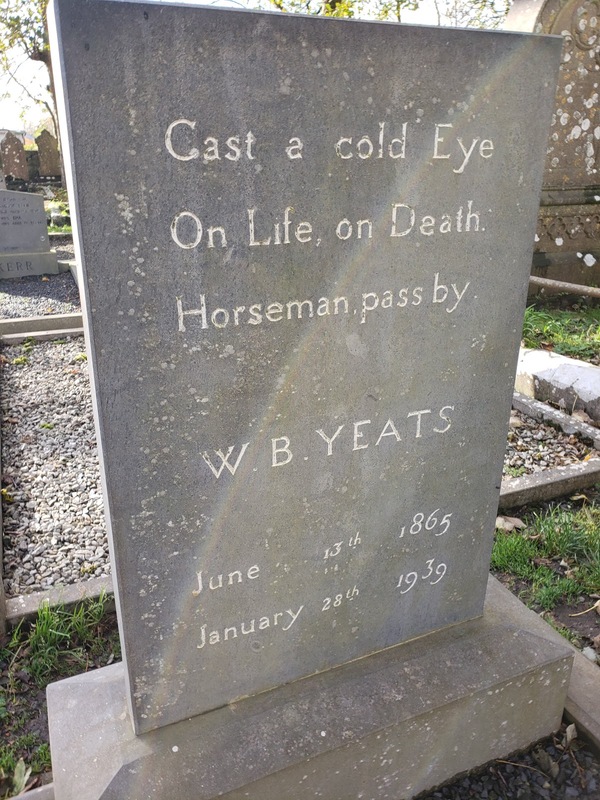 After the tour and lunch at Lily’s and Lolly’s Café, named for his sisters, we hired a taxi to visit Yeats’s gravesite just outside town. 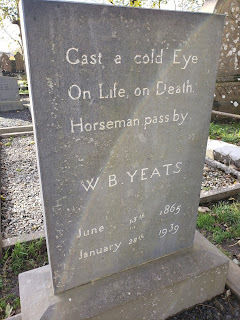 Yeats wrote his own epitaph -- “Cast a cold Eye on Life, on Death. Horseman, pass by.” -- for his gravestone that faces photogenic Drumcliffe Church and also Benbulben, the dramatic mountain beneath which he wished to be buried. Our driver, a quiet, older gentleman named Gabriel Doherty, turned off the meter and told us to take our time visiting while he had a cup of tea in the tea shop nearby. In the stone church, I was warmly greeted by a tall, bearded man in a cassock. He showed me a brass plaque honoring Yeats’s paternal grandfather, who was rector in the 19th century. We talked about the importance of remembering history. Doherty then kindly offered to take us to Glencar Waterfall, which figures in the Yeats poem, “Stolen Child,” and he went out of his way so we could take pictures of majestic Benbulben. Ireland celebrates its literary and historical heroes unapologetically and without angst. It’s a stark contrast with the very American urge to examine fully the faults in our past. After suffering severely under British rule, Ireland ultimately gained independence and became a republic after the bloody Easter Rising of 1916. Rebels seized the General Post Office building in Dublin, and their leader, Patrick Pearse, a poet himself, read the Proclamation of Independence there on Easter Monday. Executed by British firing squad, Pearse became a martyr. Today, the GPO Museum tells the Easter Rising story poignantly and dramatically. Posters of the proclamation are all over the city, so people never forget. At the National Library of Ireland, the “Yeats: The Life and Works of William Butler Yeats” exhibition opens in a space where you hear recordings of Yeats himself and others reading his poems before you explore the exhibits. Yeats and the three other Irish writers who won the Nobel Prize for Literature are among authors celebrated in the Writers Museum. The James Joyce Centre a few blocks away tells the novelist’s story. “The Dead,” a 1987 movie directed by John Huston based on Joyce’s masterful short story, plays on a loop. In the courtyard is the original door from No. 7 Eccles Street, Leopold Bloom’s address in “Ulysses.” The house was demolished but the door was saved. On our last full day in Ireland, we lucked into a taxi whose driver attended the same Jesuit high school as Joyce -- Belvedere College -- and is a writer. Driving slowly past the school, he asked if we’d seen the statue of playwright Oscar Wilde in Merrion Square with his quotes. We hadn’t. He was right, of course. The statue was colorful and the quotes thought-provoking – just like Ireland.